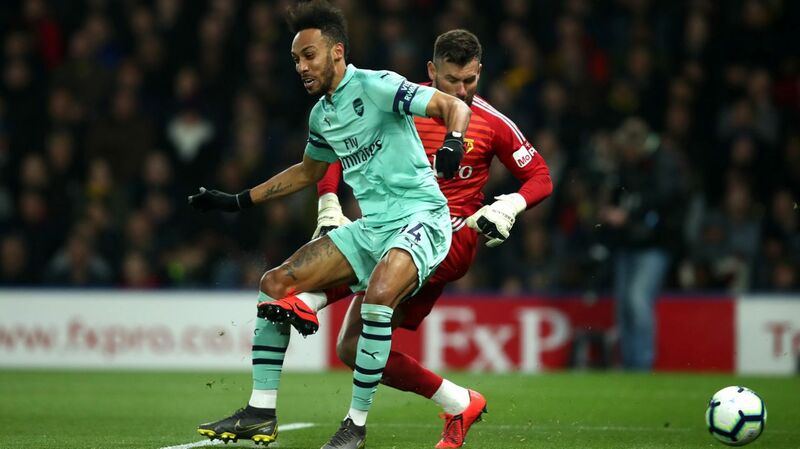 Just goal made the difference at Vicarage Road on Monday night as Unai Emery flung his side back to fourth position after a 90-minute affair filled with several heart-in-the-mouth moments as a result of Arsenal’s lack of tact and hunger. Sokratis Papastathopoulos missed out through suspension while Ainsley Maitland-Niles, Sead Kolasinac, Mesut Ozil as well as Alexandre Lacazette dropped to the bench. Nevertheless, the team deployed for the night was more than capable to get the job done. Arsenal had a slow start, making Watford look like Barcelona with their threatening moves. The hosts' dominance lasted just a few minutes, then we struck. Call it a rough lucky goal or whatsoever you like but it was a golden chance well taken by Pierre-Emerick Aubameyang. Ben Foster in an attempt to clear a back pass misfired thereby aiding an interception that got the ball rolled into the net. 1 nil to the Arsenal, 18 league goals for the Gabonese! That was not enough woe for Watford who seconds after conceding, got Troy Deeney, the guy who jibed the Gunners by saying the lacked cojones, sent off for an elbow challenge on Lucas Torreira. The aftermath was a gruesome one with Watford constantly making crazy attacks despite being a man down. We would have lost our lead in the first half if not for the class of Bernd Leno who made stunning saves to keep us in the contest. Of note was his timely intervention to deny Etienne Capoue’s free-kick. The scoreline did not change at the end of 45 minutes. Ozil came on for Torreira at the start of the second half and Arsenal went on to play their trademark tiki-taka football moments before the encounter went tense once again. We also saw the substitution Mavropanus and Ramsey for Matteo Guendouzi and Aaron Ramsey in the 59th and 68th minute respectively. The Hornets were almost back on level terms through an Adam Masina curl that struck the woodwork. It was a deadly warning to the visiting side. Oh My Nileeeeees! If you ask me, he deserves to get the Man of the Match award for that late block he made as Andre Grey headed for goal. The right-back was just at the right place at the perfect time. The performance from Arsenal deserves no applause considering the way they played an incomplete lesser side. They will not care for any laudation as long as they left with all three points required to take them back to Champions League zone. Ironically, the epileptic display from the North Londoners still resulted in a long sought after feat for them. It was their first away clean sheet in a Premier League match this season. The return leg of the Europa League quarter-final with Napoli is next for Arsenal. They go into the tie being at an advantage since they won 2-0 at home last week. A visit by Crystal Palace follows after the aforementioned.